Arriving into Pastoral Vadi, two miles into the hills from Yanıklar, descending the steep, narrow driveway, the ground flattened and opened out in front of me. I could hear voices, but could not see their source; I could see buildings, grape vines, citrus trees and a dog, but not people. The dog, Şansli, was quite old looking, and a quick visual risk assessment determined he was more likely to fall asleep on me than bite me. Without even a bark, he wandered up to me with the weight of the world on his shoulders, then past me, for a well-deserved lay down in the sun. I rounded the main building and on the front patio, heavily covered by foliage, sat two men; Arda and Bünyamin. 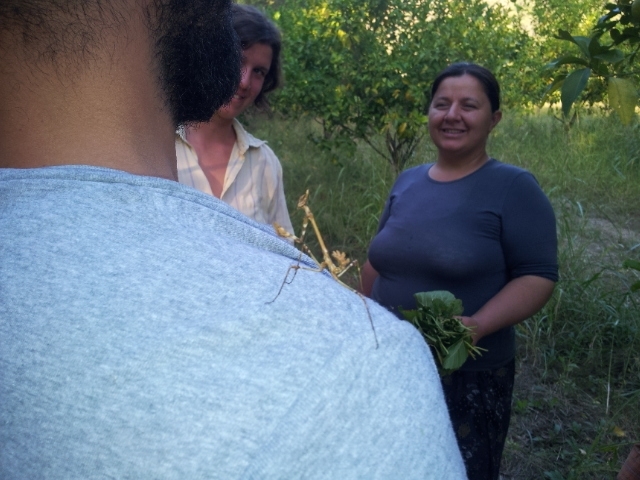 Arda (and his wife Gloria) are responsible for the day to day management of the farm. Bünyamin is a long term volunteer, working at Pastoral Vadi for the last five months, who I will share a room with for the duration of my stay. Arda showed me around the farm which comprises land for growing fruits, vegetables and nuts, space for ducks, chickens, goats and sheep to graze, and bungalows, guest houses and yoga studios for visiting guests. It is a very beautiful and tranquil setting with open land for farming, woodland surrounding the guest accommodation, summer kitchen and dining areas, and the river flowing along one side. I instantly felt at home. Even more so once Arda explained their ethos, which was to work together in a relaxed way, and to enjoy the atmosphere and company of others, while completing the necessary jobs. He also told me to embrace the chaos. I was introduced to a very nice group of young people from Holland who were visiting for two weeks as part of a government funded program. 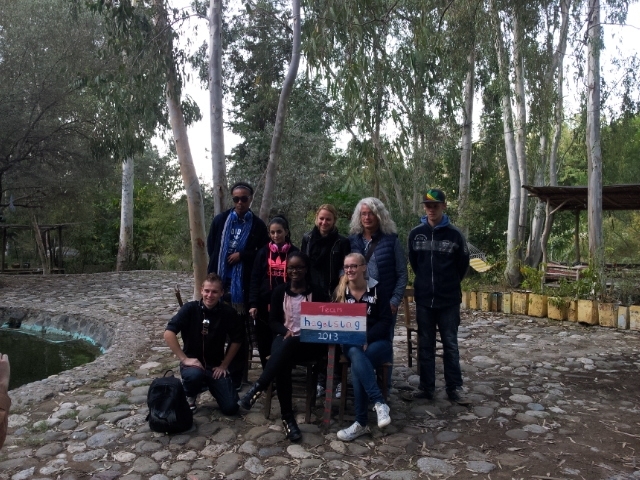 The emphasis was on enabling these youngsters to travel outside of their home country (in many cases for the first time), work together as volunteers to develop their social skills, build confidence in their abilities, and to achieve their own pre-agreed personal goals. They really were a great bunch of young adults, and from what I could tell, they were all well on their way to becoming whatever it was they chose to be. For the rest of the afternoon I was put to work observing and getting to know the environment and people in it, the real work would begin the next morning. 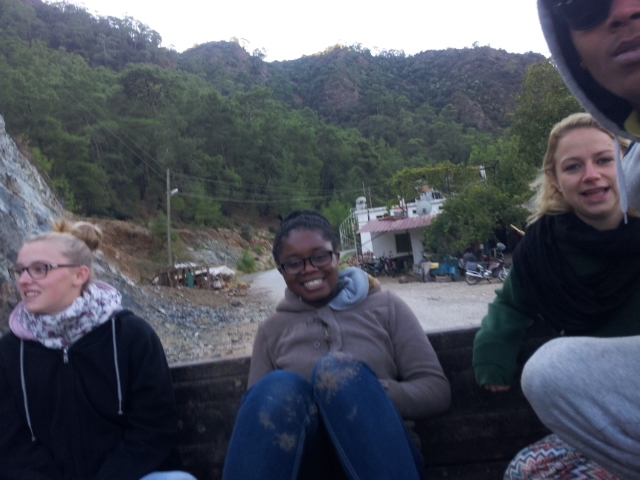 Starting at seven thirty, I joined the Dutch group and İşil, another volunteer of ten days, in the back of an open top trailer. I wasn’t sure what I would be doing, however, the Dutch group were already familiar with the back of the trailer. There was an underlying sense of excitement when the tractor jerked forward into first gear and started to climb the steep driveway. The air was cool and fresh, the road tight and winding. We bounced along joking and laughing until the tractor slowed to descend the steep banks of a river. It felt a bit like a fairground ride; the angles of the banks looked too steep, the river too fast flowing and deep, with large rocks visible through the crystal clear surface appearing impossible to pass. Stopping to engage the low range gear box, and as if being pulled along on rails, the tractor made light work of the river and it’s banks, and pass it we did. Our task was to collect rocks from the widening banks of the river, to be used along the banks of the same river within the grounds of Pastoral Vadi, creating a new area to practice yoga. The work was simple and we naturally began to form small teams, passing rocks along a line into the back of the trailer. In the afternoon we worked together to complete the final steps of the Tarhana making process. Tarhana is first made by drying tomatoes, peppers and rosemary with salt, in the sun, to form what looks like (to the un-trained eye) red speckled cement. The texture and density is also similar to cement, requiring a heavy stone grinding-wheel to reduce it to a fine powder, which is then used to make soups and flavour other dishes. 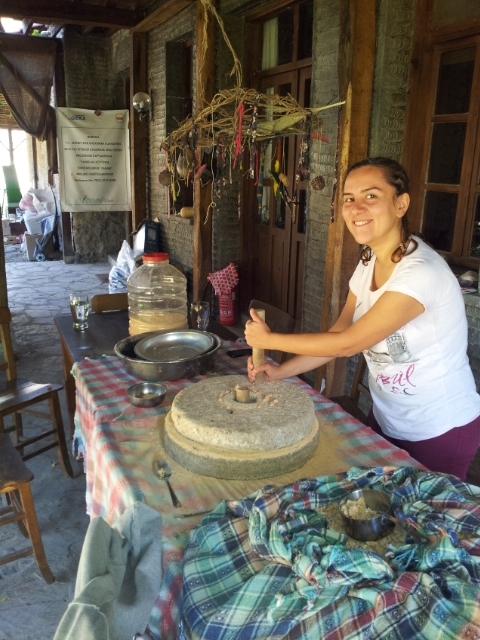 Our job was to grind the dried cement using the hand operated stone grinding wheel, collect the resulting powder and pass it through a sieve into large containers, ready for the kitchen to use. The Engineer in me was busy thinking up ways to automate the process using Shurly Anne’s gears and a giant hamster wheel for the cats and dogs to run shifts in. Other jobs for the week included collecting green matter for the compost heap, picking grapes, cleaning the winter kitchen in the main building before moving the contents from the summer kitchen into it, collecting wood for the wood burning stoves, picking olives, shelling peanuts, digging water channels in the fields to enable water to reach the crops, collecting dung and distributing it amongst the fields, and moving the rocks we collected into large steel nets along the river side. The volunteers are also responsible for preparing the breakfast in the morning, cleaning up after each meal, and keeping the volunteer rooms and bathrooms clean and tidy. The working hours are six hours a day, six days a week, leaving one day a week to fill however we please. During my first day off I visited Fethiye courtesy of a very friendly chap called Halil, who I unintentionally thumbed a lift with after mistaking him for the scheduled Autobus. Halil was returning to Fethiye after dropping some tourist off at the airport and stopped when I put out my hand – result! Halil drove me to the centre of Fethiye and proceeded to buy me a cup of çay, gave me his telephone number and invited me to call him when I wanted to visit him and his family at his home for something to eat. Amazing! Another wonderful example of the kindness and generosity of the Turkish people. It took a couple of days to relax into the slower pace of life on the farm; the work needs to be done, but there is little concern over speed and efficiency. The emphasis is on doing a good job, enjoying the process, and working in harmony with others and the environment. It’s very refreshing and creates a wonderful sense of wellbeing. At some point during most days I have considered my circumstances; where I am, what I’m doing, and from an incredibly basic lifestyle I find myself marvelling at the quality and richness of experience flowing through my days; playing a football match in the afternoon during an extended lunch break, (Holland versus Turkey with a couple of Americans and a Scot thrown in for good measure), eating freshly picked, organically grown fruit and vegetables with every meal, the simple pleasure of picking pomegranates, lemons or whatever else needs to be harvested, while chatting with like-minded people or practicing new Turkish words and phrases – all these things are nourishing for the soul. There is so much for me to learn about living more fully. Life can be like a series of detached events being checked off a to-do list, each one completed while thinking about the next, never fully experiencing what you are doing because, perhaps, you would rather be doing something else. Maybe the length of your to-do list is overwhelming and there aren’t enough hours in the day. But what purpose does a to-do list serve if it never gets completed? What would happen if you wrote down a ‘doing’ list instead? There would only ever be one item on it (if you’re a man!). Becoming fully engaged with what you are doing and giving yourself freely to it, for as long as it takes, could be the beginning of a beautiful reconnection with the meaning of life itself. Next up, a look at the journey so far, and finally, a route through the Middle East. Check back soon or fill in your name and email below and I’ll send it straight to your inbox. Fraser – the writing gets more philosophical and the journey is not just geographical but spiritual, too. Other books on cycle trips that I have read often drift into this territory and the great feeling of living in the moment is a common theme. On a lesser scale, as a tottering Saturday tourist, I can see this – just being in the quiet lanes near home can lead to a reverie (spell soon broken by some 4 x 4!). I don’t think I get this too often – maybe at an event like a football match where the mind is focused, or listening to music (when Karen is out!). It isn’t easy to achieve at work here, although your work in Turkey is conducive to it. There’s a book here, you know, I regret not getting to know you better when you were here, but this has been redressed somewhat by reading about the trip. It has become essential…more please…. Hi Geoff, I was hoping the journey would cause me to make new connections and discovery’s on a philosophical level, and I haven’t been disappointed. Being in the present moment isn’t easy, but well worth the effort. The great thing is it’s always there, whatever you’re doing, if you can quieten down the noise and tune in to it. That’s the challenge we all face. Loving all your updates Fraser and totally agree with the earlier post …. you have a book in you and what an uplifting , pleasurable read it would be …. take care. After another interesting day on the Farm and a busy evening helping to prepare food for the guest, it’s always humbling to receive encouragement from a reader.